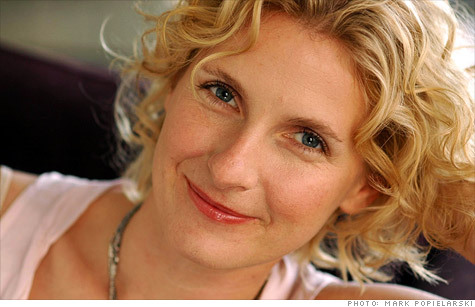 Elizabeth Gilbert won many fans with her best-selling book 'Eat, Pray, Love.' Now she is doing the same with Two Buttons Imports, her shop of exotic textiles from South Asia. NEW YORK (CNNMoney)��� -- To most people, Elizabeth Gilbert is the globetrotting, best-selling author of "Eat, Pray, Love." But in Frenchtown, N.J., she's known as a co-owner and occasional salesclerk at Two Buttons Imports, an import company that sells exotic wares, antiques and curios from South Asia. Recently, Gilbert has been spending most of her time writing a novel about botanists and finishing up a book tour for her other memoir "Committed: A Love Story." So Jose Nunes, her husband and co-owner of the four-year-old shop, is minding the store. Nunes is the love in "Eat, Pray, Love." In the movie he's played by Javier Bardem, who whisks Julia Roberts's character (Gilbert) off her feet in Bali. In real life, Nunes, 59, is more likely to be striking up a conversation with the store's customers than striking a pose on the red carpet. But that's fine with Nunes who loves talking about the shop. Two Buttons is just off the main road in Frenchtown, a quaint village of large Victorian homes near the Delaware river. Based in a pale yellow warehouse, the shop is nearly 8,000 square feet. Its floors are crammed full of items, mostly from South Asia. There are giant stone statues, ornate wooden furniture, grinning colorful masks, bowls of shiny jewelry, flowy scarves and more. On the days it is open, Wednesday through Friday, the store sees a steady stream of customers who come to ooh and ahh over the items and, of course, see if they can catch sight of Gilbert. Photo gallery: Celebrities you didn't know were entrepreneurs. Five years ago, Elizabeth Gilbert was a respected journalist and author but certainly not a household name. That all changed in 2006 when her memoir "Eat, Pray, Love" was published and landed on the New York Times best seller list. The book, which is about Gilbert's search for love and spiritual fulfillment as she travels abroad, has more than 10 million copies in print, according to her website. The idea for the name Two Buttons came after a priest in Laos told the couple that their love for life was so great that they needed nothing more than two buttons in their pockets to get by. "Actually, sometimes we have gotten by on only one button," Gilbert wrote on the shop's website. A fire elsewhere in the building caused the original store to close in early 2009. Undaunted by the calamity, the couple decided to purchase a 16,000-square-foot warehouse, also in Frenchtown. To buy it, they used some of the proceeds from the "Eat, Pray, Love" movie, which was set to debut the following year. They dedicated almost half of the space to the shop and then spent months renovating it. The new Two Buttons opened in October 2009. "This building is an homage to Julia Roberts," Nunes joked. Each year, the store closes in January and February, so that Nunes and Gilbert can travel to find more of what they call "treasure." Two Buttons does not have a listed phone number, because the couple does not want to be deluged with calls. Word-of-mouth seems to be doing fine. Customers fill the store and then go and patronize other businesses in the town -- an effect which could be called the Two Button bounce. "We're one of the few downtowns that is thriving at this point," said Ron Sworen, the mayor of Frenchtown. "It's partly because of them." The store employs local people -- mostly young men able to lift statues and furniture. "I'm not getting any younger," Nunes said. The clerks offer wine (a 2009 Anakena Carmenere from Chile's Rapel Valley is among the favorites) and small paper cups to customers as they walk around the store. Bangles, fabrics and totems fill tables and shelves throughout, leading one visitor to giddily announce: "I don't know where to begin." On a recent visit there, Nunes hurries through the store, moving statues and helping to unload a new shipment of merchandise from Indonesia. In the storage area of the warehouse, he shows off a becak -- or Indonesian rickshaw -- and rooster-shaped mast holders from boats in Madura, Indonesia. "There's a very good energy here," said Debra Weiss-Otterpohl, a recent visitor from Pennington, N.J., who has visited the shop several times. Nunes, a former gem dealer and jewelry maker, said Two Buttons is profitable. In addition to owning Two Buttons, Gilbert and Nunes are landlords and have rented out the rest of the warehouse to a Pilates studio and Lovin' Oven, a restaurant that serves cuisine with local ingredients. There is also space for artists. "It's nice to be a part of a community," said Nunes about Frenchtown. "It's so small, we can have an impact." Kate Middleton 'Fascinator' hats a hit in the U.S.